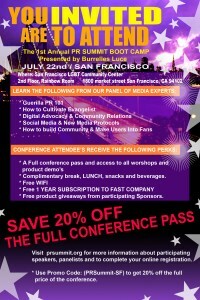 I’ll be speaking at THE 1ST ANNUAL PR SUMMIT BOOT CAMP PRESENTED BY BURRELLES LUCE. •	PR Summit Boot Camp Conference explores the following concepts: ‘How to build community’, ‘Making users into fans’, ‘Guerilla PR 101’, ‘Digital Advocacy & Community Relations’ and ‘Cultivating Evangelists’. On Thursday, July 22, The PR Summit Boot Camp is a one-day conference focused on providing up-to-date tools for professionals working in media and those starting to utilize different media to reach their target audience. While today’s media landscape is littered with mixed messages and failed PR coups. This conference will provide attendee’s with an opportunity to listen, connect and follow the insights and the conversation of media experts, who span a wide-variety of vertical markets and industries. The PR Summit Boot Camp Conference addresses the changing media & public relations landscape. Industry professionals, who work with a variety of both vertical and horizontal markets, will provide attendees with the latest case-studies, insights, tools, fresh ideas and best practices that can be applied to a person’s skill set. A highlight of the conference will be a keynote address given by Akilah Bolden-Monifa, who is the Director of Communications for CBS 5 I The CW 44cable12 and CBS RADIO. She will discuss the topic of “Combining Generation 1.0 media with 2.0 plus media to get the word out.” Additionally, Dan Martell, Co-Founder of Flowtown will give a talk focused on “Social Media Part II: Monetizing Popularity on Facebook, Twitter, etc. For more information about participating speakers & panelists and to complete your online registration, please visit www.prsummit.org. Hope to see you there Divas!